Raise funds quickly and easily with the tools in this kit! If you're throwing a special event for your nonprofit, the businesses within your community can be excellent resources, especially when it comes to fundraising events. But how do you go about approaching a business for sponsorship, especially in a rough economy? 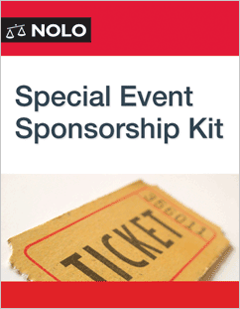 Use Nolo's Special Event Sponsorship Kit to take steps toward securing sponsorship, as well as keep the right records to submit to the IRS come tax time. Business Pledge: gives the business owner an easy way to say "yes"
Use the complete instructions in this kit to help your nonprofit raise money from the businesses in your community.